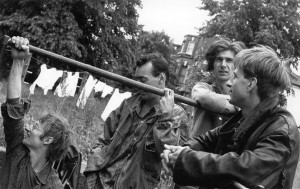 The Work, like the name suggests, had a tough, non-nonsense, committed approach to music, spiced with ear-bending timbres and the occasional glimpse of British humour if you looked carefully. I reckon they fall into the same loose bag and era as PIL, The Fall, This Heat, Gang of Four, and so on. As you can see, an abundance of four-letter words. No frills, sometimes an almost dour militaristic beat, yet out there on the bleeding edge in terms of sounds and structures. That idea of using a mixer to distort the sounds, by feeding the output of one instrument’s channel into the input of another instrument’s channel? 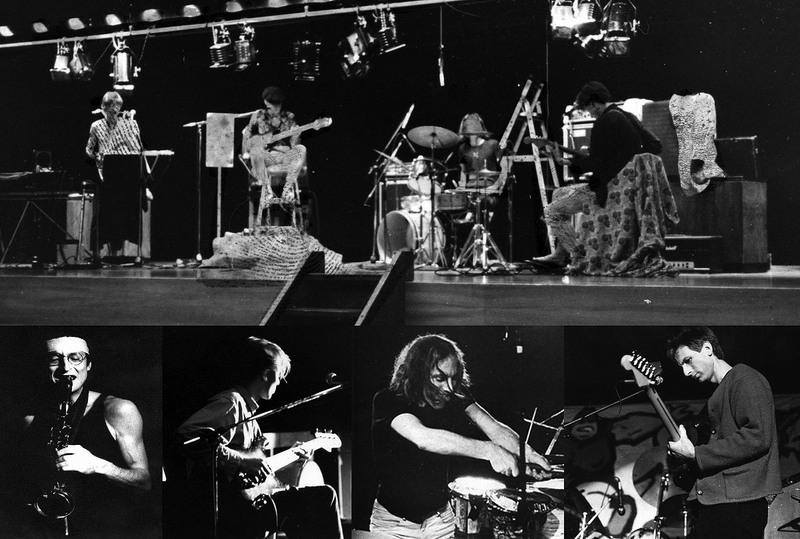 Tim Hodgkinson informed me that Anthony Moore was one of the first to do it, on Henry Cow’s “In Praise of Learning” album (1975). In those days there were much fewer effects pedals available, and if one was on a low budget, other ways could be found by those with inventive minds. I have not tried it, yet, but it seems to me to be a great hands-on pre-digital version of AM and FM (not as in radio, as in DX7 for example). Of course, here in Japan, one experimentalist, Toshimaru Nakamura has taken the idea a radical step further. Why bother with instruments? Just the mixer on its own will do, as any mixer has hums and crackles which can be fed back to create noise/music. No-input mixer music is also performed by Croatian Marko Ciciliani and can be surprisingly funky at times. “I’m actually the member of The Work who didn’t get to play on their fine track on ‘Miniatures’. They recorded it one day when I wasn’t there (I had to earn a living as a builder’s mate back in those days). I remember turning up in the evening to learn that ‘With Wings Pressed Back’ had been recorded. Since his last gig with the Work in 1994 Bill Gilonis continues to work as a musician, composer, sound engineer and record producer. He has written music for theatre, taken part in multimedia performances and, most recently, released a CD with Canadian composer Chantale Laplante of electro-acoustic compositions. His first book, ‘Lost in translation’ (with Alex Julyan), was published in 2009 and he is currently looking for a publisher for his second. Since moving to Zurich, Switzerland, in 1993 Bill Gilonis has also worked as a teacher and translator, indulging a lifelong interest in riddles, ambiguity and language. 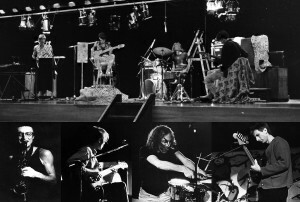 The Work: original line-up. This photo, taken in Chris Cutler’s garden in Brixton, is nothing special but has the distinction of never having been used before. The photographer had a memorable & great name: Mina Panik. 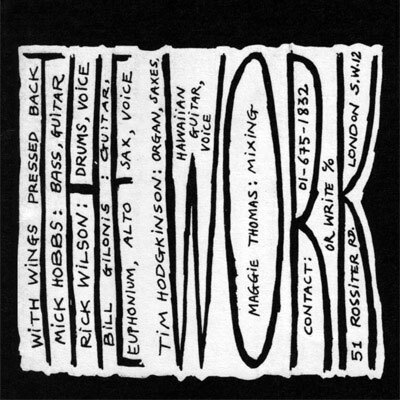 The Work: line-up that went to Japan in 1982: Tim Hodgkinson, Bill Gilonis, Chris Cutler & Jim Whelton. I was the drummer with The Work on ‘With Wings Pressed Back’. From what I remember about the session, I played my way into the already-recorded guitars and my sketches were deemed just the job. I never got to colour them in. Possibly the right move (or lack of it). Since that time I’ve been with the group in its two lives but have largely worked as a musician in education and with young people. Punctuating this, I’ve studied temple drumming in south India and worked with theatre, film, dance and for radio, usually on original material. Happily,I get to work on a very wide selection of things – from large outdoor environmental art events to my current role as recordist, editor and archivist on a year long project along the border lands of Offa’s Dyke. I’m a regular accompanist to two storytellers and have had two original cds with my name on. Somewhere in the middle of all this I got a music degree at SOAS specialising in Indian and African music. Blimey, that’s compressed a huge quantity of life into such a small space. Hope some / all is usable.